The Telecommunication Regulator of Cambodia (TRC) has issued mobile phone operator Smart a third warning over its generous top-up bonuses for customers, saying the firm is creating unfair competition among the country’s eight other operators. Commerce Minister Cham Prasidh has signed a rice deal with the Philippines, as Cambodia tries to find new markets for its increasing supplies of domestically milled rice. The Pursat Provincial Court on Friday charged Krakor district’s judicial police bureau chief for taking bribes in order to allow illegal fishing in the Tonle Sap Lake, officials said Sunday. Police shut down an Australian-run orphanage in Phnom Penh’s Mean­chey district on Friday after children from the organization’s center escaped last month and reported incidents of beatings, anti-human trafficking NGO Sisha said in a statement. 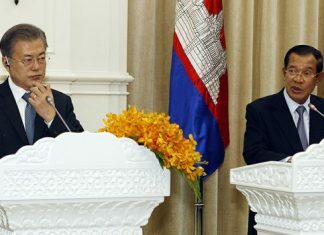 The Minister of Posts and Tele­com­munications on Thursday defended the appointment of the former Tele­com Cambodia (T.C.) director- general to the position of an undersecretary despite ongoing investigations into his involvement in alleged corrupt acts and embezzlement of funds at the state-owned company. Former Telecom Cambodia director-general Lao Saroeun, who stepped down from the state-owned company amid accusations of mismanagement and corruption, was on Monday appointed to a new position at the Ministry of Posts and Telecommunications. Four Khmer Krom men were arrested by Thai authorities in Thailand’s Pathum Thani province outside Bangkok and are being charged with what Cambodian police claim are acts of terrorism and plans to attack Prime Minister Hun Sen’s government. About 200 armed police officers and local authorities on Tuesday forcibly evicted 21 families from their homes in Preah Sihanouk province’s Stung Hav district and destroyed their houses with excavators and bulldozers.